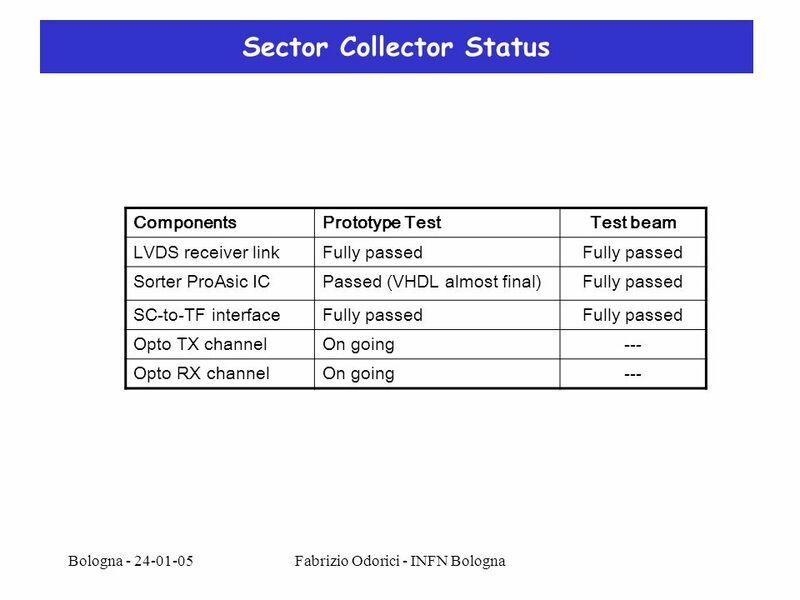 1 Bologna - 24-01-05Fabrizio Odorici - INFN Bologna DT Sector Collector LVDS link: - 2 Ethernet cables/minicrate FTP cat.6 - TX rate @ 480 Mbps (< 50 m), with National Semicond. chipset: a) serializer 10-1 DS92LV1021 (8 IC/link) b) cable equalizer CLC014 (8 IC/link) c) deserial. 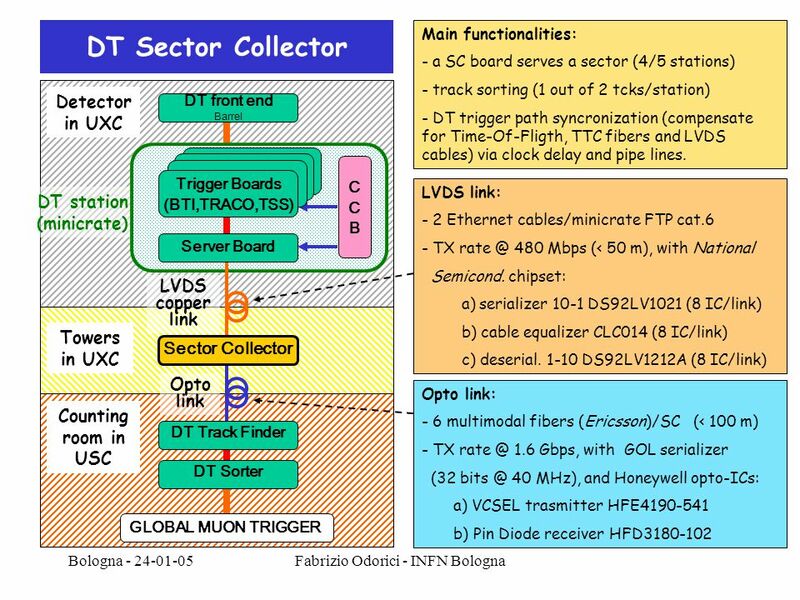 1-10 DS92LV1212A (8 IC/link) Opto link: - 6 multimodal fibers (Ericsson)/SC (< 100 m) - TX rate @ 1.6 Gbps, with GOL serializer (32 bits @ 40 MHz), and Honeywell opto-ICs: a) VCSEL trasmitter HFE4190-541 b) Pin Diode receiver HFD3180-102 DT front end Barrel DT Track Finder DT Sorter GLOBAL MUON TRIGGER Detector in UXC Counting room in USC LVDS copper link Opto link Towers in UXC DT station (minicrate) CCBCCB Trigger Boards (BTI,TRACO,TSS) Sector Collector Server Board Main functionalities: - a SC board serves a sector (4/5 stations) - track sorting (1 out of 2 tcks/station) - DT trigger path syncronization (compensate for Time-Of-Fligth, TTC fibers and LVDS cables) via clock delay and pipe lines. 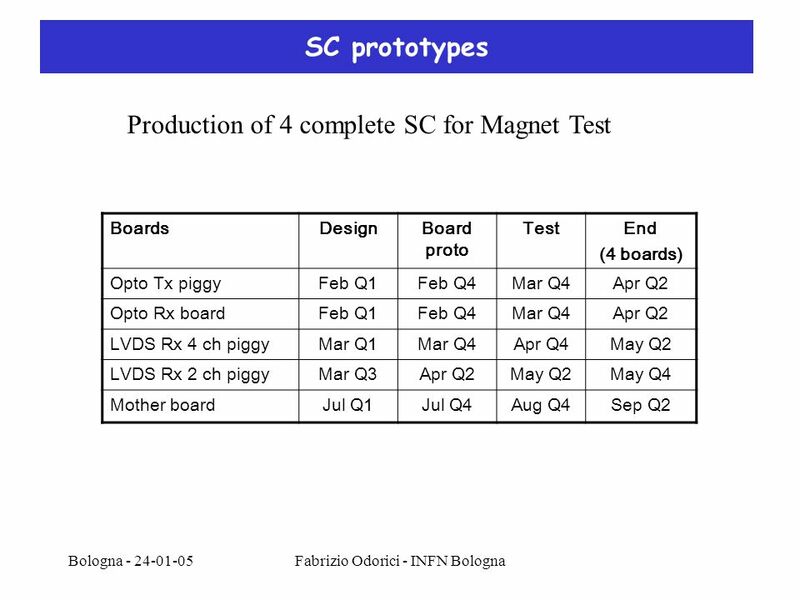 Download ppt "Bologna - 24-01-05Fabrizio Odorici - INFN Bologna DT Sector Collector LVDS link: - 2 Ethernet cables/minicrate FTP cat.6 - TX 480 Mbps (< 50 m),"
1 Calorimeter Trigger to L1-Board data transmission Umberto Marconi INFN Bologna. Forward Detector Meeting, 11 Mar 2003Børge Svane Nielsen, NBI1 Si-FMD status Forward Detector meeting, CERN, 11 March 2003 Børge Svane Nielsen Niels Bohr. C. Fernández Bedoya, A. Navarro, I. Redondo. C. Fernández Bedoya November 29th, Goal: Replace SC crate with simple CuOF electronics and place TSC. CPT Week, Nov 2003, B. Paul Padley, Rice University1 CSC Trigger Status, MPC and Sorter B. Paul Padley Rice University November 2003. Interconnection boards Test data memories VME interface Trigger TX Trigger RX FPGA: memory and I/O control DAQ pipelines and buffers DAQ interface. CSC Muon Trigger September 16, 2003 CMS Annual Review 1 Current Status of CSC Trigger Elements – Quick Summary Jay Hauser, with many slides from Darin. S. Silverstein For ATLAS TDAQ Level-1 Trigger updates for Phase 1. DAQ for KEK beam test M.Yoshida (Osaka Univ.). Components VLPC readout –Stand Alone Sequencer (SASeq) Slow < 100Hz –Buffering VLPC data with VME interface. RPC Trigger ESR Warsaw 08 July 2003 F. Loddo I.N.F.N. Bari Status report on RPC FEB production Status report on RPC Distribution Board Interfaces RPC-LB. Bologna, 10/04/2003 Workshop on LHC Physics with High P t Muon in CMS R.Travaglini – INFN Bologna Status of Trigger Server electronics Trigger boards TB. Status and planning of the CMX Philippe Laurens for the MSU group Level-1 Calorimeter Trigger General Meeting, CERN May 24, 2012. Leo Greiner IPHC testing Sensor and infrastructure testing at LBL. Capabilities and Plan. 1 L0 Calorimeter Trigger LHCb Bologna CSN1 Assisi, 22/9/04 U. Marconi INFN Sezione di Bologna. SPD Control Board 16th February 2005. SPD Control Board (VFE control and SPD multiplicity) VFE’s control (I2C communication: SDA,SCL; clock; reset/trigger.